An anthology of stories, essays, interviews and photographs curated by Robert Carrithers and Louis Armand. An extract (6000 words) from Phil’s New York book STRIPPED is included, alongside work by Lydia Lunch, Nick Zedd, Nat Finkelstein, Victor Bockris, Penny Arcade, Max Dax, Anthony Haden Guest, Christoph Dreher, Marcia Resnik, Peter Milne, Rudi Protrudi, Mark Reeder, Marketa Baňková and many, many more. Also included are photos of Khmer Rouge, Fatal Shore, Jolana Izbicka and Phil Shoenfelt. The book is published by Litteraria Pragensia and takes its title from the Khmer Rouge song “City Primeval”. Robert Carrithers, curator of City Primeval: "New York Berlin Prague" on the project bringing to life the art and culture of the three cities from 1960s to the present. 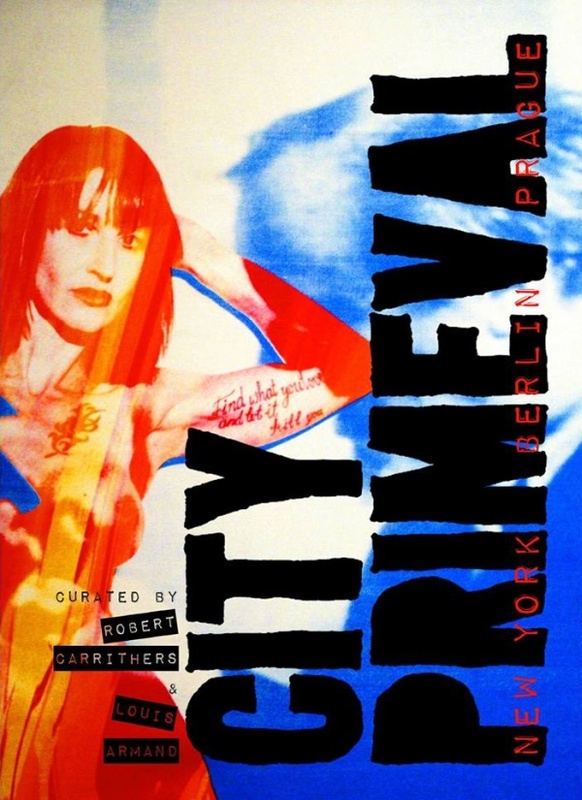 CITY PRIMEVAL is a constellation of personal documentaries of place & time by key contemporary writers, poets, musicians, designers, filmmakers, photographers, artists, editors, performers from within the New York, Berlin & Prague underground scenes from the late 1970s to the present; from New York Post-Punk & No Wave, to the fall of the Berlin Wall & Reunification, to the Velvet Revolution & the Prague Renaissance; including contributions by Bruno Adams, Penny Arcade, Louis Armand, Dale Ashmun, J.Jackie Baier, Marketa Bankova, Varhan Orchestrovic Bauer, Lina Bertucci, Gaby Bila-Gunther, Mykel Board, Victor Bockris, Christoph Brandl, Gary Ray Bugarcic, Robert Carrithers, David Cerny, Roman Cerny, Michal Cihlar, Antonio Cossa, William Coupon, Max Dax, Christoph Dreher, Sara Driver, Glen Emery, Vincent Farnsworth, Nat Finkelstein, Roxanne Fontana, Thor Garcia, Susanne Glueck, Carola Goellner, Anthony Haden Guest, Carl Haber, Jex Harshman, Henry Hills, Nhoah Hoena, Michael Holman, John Hood, Chris Hughes, Jolana Izbicka, Timo Jacobs, Bethany Eden Jacobson, Tobias Jirous, Bettina Koester, Julius Klein, Hubert Ketzschmar, Jaromir Lelek, Lydia Lunch, Rinat Magsumov, Peter Milne, Steve Morell, Mona Mur, Julia Murakami, Shalom Neuman, Paul Pacey, Puma Perl, Rudolf Piper, Rudi Protrudi, Mark Reeder, Marcia Resnick, Ingrid Rudefors, Ilse Ruppert, Simon Safranek, Honza Sakar, Oliver Schuetz, Marcia Schofield, Tom Scully, Semra Sevin, Phil Shoenfelt, Peter Smith, Azalea So Sweet, Mark Steiner, Kenton Turk, Andre Werner, Ian Wright, Nick Zedd, Dave Zijlstra, Richard & Winter Zoli, Miron Zownir. CITY PRIMEVAL: NEW YORK, BERLIN, PRAGUE is a personal journey through time in each city told by writers, artists and photographers from each city.